Nothing is more horrible then going to a public restroom! Or even worse... school restrooms! To make it even more scarier I will introduce you to Aka Manto, a Japenese Legend. 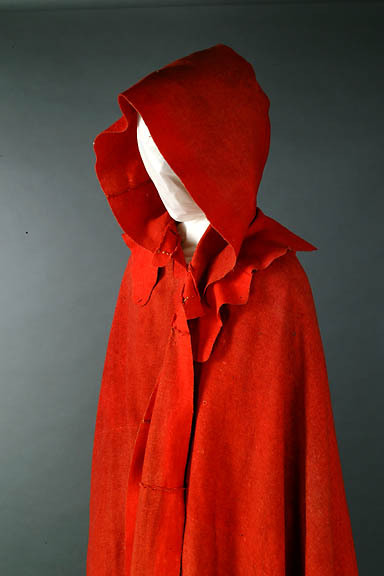 Aka Manto or Red Cape is a malicious spirit who haunts public- and school toilets. He used to be a handsome man and hides his face with a mask for his admirers. He mostly haunt women restrooms to be with girls and women. If you are sitting on the toilet (usually the last stall), a mysterious voice will ask you if you want red paper or blue paper. If you answer red paper, you will be sliced apart until your clothes are stained red. If you choose blue paper, you will be strangled until your face turns blue. Any attempt to outsmart Aka Manto by asking for a different color will result in you being dragged to the netherworld. So to be saved, you must answer with 'No'. If you say that you do not need toilet paper he will leave you alone. Aka Manto is sometimes referred to as Aoi Manto (Blue Cape). The voice will ask you if you want a cape rather than paper. If you agree to red, the skin on your back is ripped off to resemble a red cape. If you ask for blue, all the blood is drained from your body. A police man and woman were called to a school after a student reported hearing a male voice in the girl's bathroom. The police woman went to the bathroom while her male partner waited outside. The police man outside, who was listening at the door, heard his partner answer “Yes”. A sudden scream and loud thud followed. When the policeman opened the bathroom door, he found the police woman decapitated. Her blood had soaked into her vest, turning it red. This is like a typical elementary school joke, to scare your little friends with. The legend is more funny then scary. And it has a little perverse side to it. Why is the ghost of a man hanging around in the lady`s restroom. The most freaky and disturbing thing about this legend is... the restroom itself. Did you ever saw a Jesus face on your cracker? It is funny that some people claim to have seen Jesus on there door or cracker or whatever. Or a coffee stain that looks like a holy man. But what if there appears faces on your floor, and they keep returning? The Bélmez Faces or the Faces of Bélmez is an alleged paranormal phenomenon in a private house in Spain which started in 1971 when residents claimed images of faces appeared in the concrete floor of the house. These images have continuously formed and disappeared on the floor of the home. 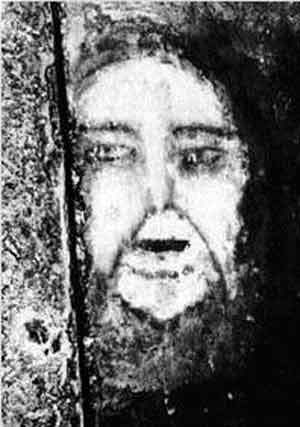 The appearances in Bélmez began on August 23, 1971, when María Gómez Cámara claimed that a human face formed spontaneously on her cement kitchen floor. María's husband, Juan Pereira and their son, Miguel, destroyed the image with a pickaxe and new cement was laid down. However, the Pereira story goes, a new face formed on the floor. The mayor of Bélmez was informed and forbade the destruction of the new face. Instead, the floor cement was cut out and taken for study. The phenomenon is considered by some parapsychologists the best-documented and "without doubt the most important paranormal phenomenon in the 20th century". Various faces have appeared and disappeared at irregular intervals since 1971 and have been frequently photographed by the local newspapers and curious visitors. Many Bélmez residents believe that the faces were not made by human hand. Some investigators believe that it is a thoughtographic phenomenon subconsciously produced by the owner of the house, María Gómez Cámara ("Thoughtography" is considered a form of psychokinesis among parapsychologists). But the freaky part still have to come! The property was known to have been a graveyard in the past, so the floor was excavated in hopes of finding whatever was causing the phenomena. When they dig under the floor they discovered the remains of humans! 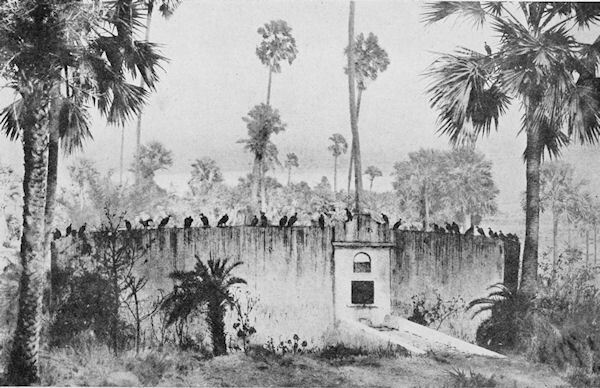 Possible remains of the graveyard. 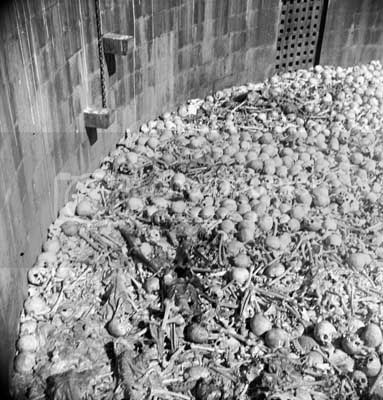 After giving the human remains a proper burial they installed a new floor. Two weeks later, another man's face appeared, and two weeks after that, the face of a woman surrounded by 9-15 tiny faces. The floor was torn out a number of times, but the faces returned every time it was restored. The images were scrubbed with detergent, but though the eyes widened and the expressions changed, the pictures persisted; over time, the faces seemed to age. Chemists tested samples of the cement, but found no evidence of paints or dyes. Although the events continued through 1972, there is a dearth of photographic and other hard evidence, scientific explanations.were quickly abandoned. The debate over whether this was a case of fraud, a haunting, or psychokinetic influence (the faces' expression would sometimes change depending on Maria Gõmez Pereira's mood) has never been resolved. Skeptical researchers point out that unlike other psychic claims this case is falsifiable. Since the faces of Bélmez are fixed on whitewash of cement, scientists are able to analyze the molecular changes that took place in such mass of concrete. 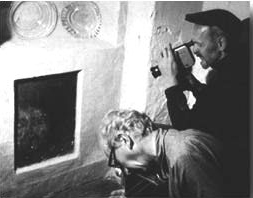 The main researchers of the Bélmez case were Hans Bender and Germán de Argumosa. Both collaborated in Bélmez and Freiburg in the early 1970s when the ostensible phenomenon began. However, neither Bender nor de Argumosa published an official report on them. Inexplicably, Bender wrote very little about the case in his journal Zeitschrift für Parapsychologie. Argumosa, a Spanish parapsychologist spent two years evaluating what he believed was a Gothic mystery, but published nothing on the subject either. However, Bender did mention the case in passing and referred to it in some of his lectures. His crucial statement referred to the sealing of areas of the floor where some faces were in progress with a transparent plastic material. The only believer who has published an entire book on the case is José Martínez-Romero. His book Las Caras de Bélmez is a collection of anecdotes. Martínez-Romero is not worried about falsifying the paranormal hypothesis. (An advantage of this and other cases of ostensible thoughtographic appearances is that, as the paranormal interpretation is falsifiable, it is not a pseudo-scientific hypothesis.) Argumosa himself, who used to be the main defender of this case in Spain, believes that Martínez-Romero discredited the phenomenon with his book. The most serious publication to date by a believer appears in the first chapter of the book The Seen and the Unseen by Andrew MacKenzie. However, MacKenzie did not speak Spanish and during his stay in Bélmez lacked an interpreter. Only a taxi driver and Martínez-Romero's son were able to assist him, though very little. 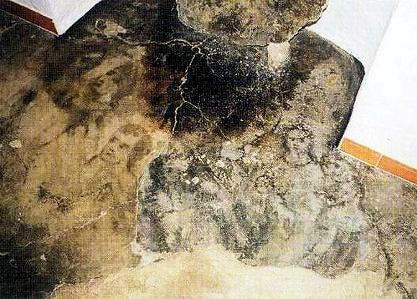 Luis Ruiz-Noguez believes that the most likely explanation for the visual effect of the Bélmez images is Jordán's suggestion of the use of an oxidizing chemical agent. For example, nitric, sulfuric, muriatic, acetic acid, and others, could be used to obtain such an effect. Another explanation might be the use of agents sensitive to light (which was not mentioned in either Jordán or Perera's repertoire of forgery hypotheses): silver nitrate which, when subjected to ultraviolet sunlight, darkens. (3) the utilization of a pigment in a vehicle or resin, as discussed by Ruiz-Noguez in his commentary on the ICV chart. 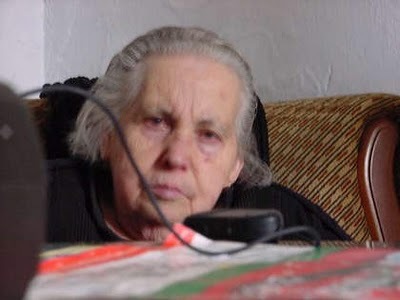 María Gómez, the purported psychic that allegedly produced the appearances, died on February 2004 at the age of 85 years. 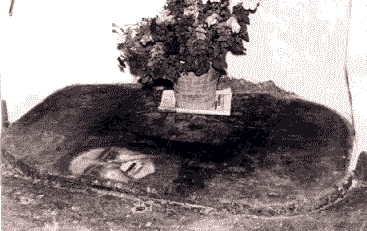 After her death the popular psychic researcher Pedro Amorós tried to "discover" more thoughtographic appearances in María's house. A new wave of Bélmez faces thus took place. However, Amorós' claims have been debunked in the Spanish media. In November 2004 the newspaper El Mundo published the article "New Belmez Faces Faked by 'Ghostbusters' and Municipal Government." On May 2007, journalist Javier Cavanilles and investigator Francisco Máñez published a book called Los Caras de Bélmez, a play-on-words that means "The cheeky evils of Bélmez", where they explain the history of the scam and pointed to María's son, Diego Pereira, as author of the mysterious paintings. When I read it for the first time, I was astonished! How freaky it is that faces appears on your floor. Luckily many people investigate it and came to the conclusion it is a hoax! It is possible the lady thought it was all real and got fooled by her own son. Some say you can tell a loth about a person by looking in his refrigerator. 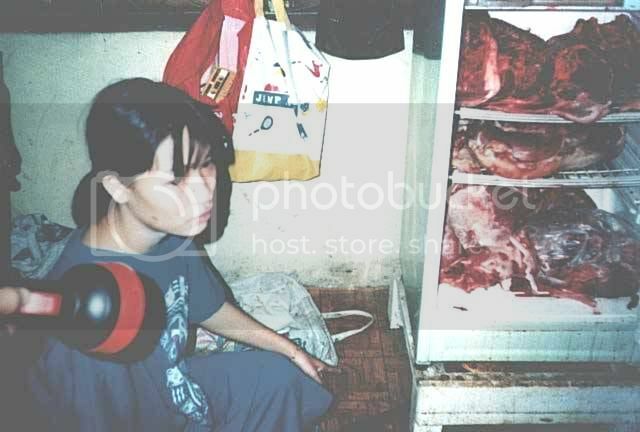 So let`s see what is inside this woman her fridge. This woman was well known for her amazing cooking. She cooked for her husband and at party`s with relatives and friends. People always asked her for her cooking secrets, but she never answerd. She gave them human flesh to eat without their knowledge. At the end the woman confessed that she killed her husband and ate his flesh. The act of this woman had been compromised by the local police, now she is ready to accept punishment for the murders she committed. All the articles I found were very short. Some say the woman was from South Philippines but other say she is not. I can`t find from what town, or what her name is. How many she killed is unknown, some say she only ate men or children. The only thing there is are the three photographs. And the woman has that guilty look on her face. There are many cases of cannibalism all over the world, so this could be true. A school boy was walking back home at night. When he crossed the railroad, he spotted a beautiful girl standing by a windowsill resting on her elbows. They smiled at each other for a moment. The girl asked him: "Where are my legs?" The boy didn`t understand it and answered: "I do not know?" The girl jumped out of the window and revealed her lower half was missing. Frightened he stood in the sidewalk looking at her disfigurement. She makes her way towards him, clawing along the ground and running on her elbows making a tek-tek-tek sound. With a scythe, she sliced the boy in half, mimicking her own disfigurement. Teke Teke is the ghost of a Japanese schoolgirl who roams the train stations of Japan. In life, this girl was a scarey cat and people are always playing practical jokes on her. One day at the train station after school, her friends decided to put a cicada, a bug that appears in the summer in Japan, on her shoulder. Sadly, this turned out to be a fatal prank. She was so scared she fell off of the platform and was hit by a Shinkansen (The fastest train in Japan) and her body was split in two. Now she is haunting the train stations of Japan, dragging herself with her elbows and sometimes her hands. She is known to kill people with her scythe and split people in half with the harsh speed of the Shinkansen to make her victims feel her pain. Her name is “Teke Teke” or “Bata Bata” because of the noise she makes when she is dragging herself around. The girl also go by name 'Kashima Reiko' that appears to be an abbreviation of Kamen Shinin Ma (Mask, dead person demon). Can you save yourself from her? There is a way to save yourself. When she asks : "Where are my legs?" You must tell her that her legs are at the `Meishin Railway` and answer `Kashima Reiko` if she asks you who told you this. But when you do not answer or give the wrong answer she will split you in two with the speed of a Shinkansen. I really do love the Japanese urban legends. This one is kinda familiar with the `Slit Mouth Woman` legend. A girl or woman who takes revenge to what is happened to her by doing the same thing on others. But is this legend possible? There are people living without legs or lower body. With medical help, they can survive. But slide someone in half with the speed of a bullet train is physical impossible. Or she must have extremely strong arms and a very sharp scythe. The legend also say when you hear of this story, you will see Teke Teke after a month nearby a train station or railroad. I live near a railroad, so I hope to meet her soon! Do you belief that we are alone? Or is there really other life outer space? Belief it or not, there are still many UFO sightings all over the world! Here is a list of the world most famous UFO sightings. These are only 20 of the many UFO sightings. I will be Blogging over some of these sightings. So keep checking out`The Horror Tree` to find out the truth! Have you played with dolls when you were young? Did you talked to them? Shared your secrets with it? I want you to meet Robert, Robert the Doll! Also known as Robert The Haunted Doll! 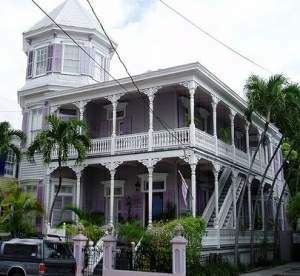 A wealthy family moved into Key West, Florida in 1896-1897. Mr. and Mrs. Otto were well known to be cruel and abusive to there servants. There youngest child, Robert Eugene (Also called Gene and born in 1900) was always watched by a certain older Behamian servant girl. This girl was treated the worst of all servants, because Gene adored her and thought of her as a best friend. Because of the abuse, the girl was planning revenge on the Otto family. She stayed up late at night, secretly creating a special "present" for Gene for his 6th birthday. The Otto family didn't know that this servant girl practised voodoo. And this is were Robert the doll was born. The servant girl sewed the doll by hand and adding a porciline head to it. It was believed she has put a curse on the doll. Filling the doll with evil relics and very tiny animal bones. At the time, it was a very nice doll. New, shiny, and sewn with a lot of craft work. The next day, she gave Gene the doll with huggs and smiles, and Gene was very happy for the wonderful gift. He was after all, a playful little boy. Gene decided to call the doll by his real name. Robert. And the name has stuck ever sense. As time went on, the Otto's noticed something very strange and wrong with there son. Gene was so fascinated with his new doll. Gene would spend hours long in his room, all alone, talking to Robert. What puzzled the Otto's even more, was that they could hear answers. A voice that was completely different from there sons. When Gene went to sleep in the evening, he would always awake the family with his screams of fright. When Mr. and Mrs. Otto got to his room, they would find Gene's furniture overturned, and Gene in his bed, trembling in the center of it all. Robert, would be sitting upright at the end of Gene's bed, glaring at Gene's parents. "Robert did it! Robert did it! Robert did it!" As conflict became frequent in the house, or if Gene ever misbehaved, the little boy would always have the same person to blame. "It was Robert," he sobbed. "Robert did it! Robert did it!" When Gene's father died, Gene got the will of the house and he moved into his family home. He got married and had a wife named Annette, otherwise known as Ann, and becoming a famous artist. Now just calling himself his middle name, Eugene Otto. Eugene Otto always preferred to do his artwork alone, secluded, with Robert at his side. Talking to it as if the doll could speak back. Eugene's wife, Ann, never liked the doll from the first time Eugene introduced it to her. It gave her the chills just to look at it, and she hated how obsessed her husband was with it. It frightened her in some way. Eventually, even though it deeply upset Eugene, Ann told her husband she was going to give Robert a room of his very own, in the attic. Which is were he stayed for a few years. Those years later, Eugene spoke up. He repeated over and over again. Warning his wife "how angry Robert was." Eugene even demanded that Robert have his own room. A proper room with a view. The guest room that looked out above the street. Ann disagreed greatly, but gave up the fight to please her husband. Kids walking by Eugene's house to school always looked straight ahead. For each day, they saw Robert leaning facedown up against the guest room window on the 3rd floor. Glowering at them, mocking them, and dancing around! Inside the house, Eugene and Ann's marriage was slowly deteriorating. Eugene was screaming and lashing out at his wife. Smashing things and running around the house like a mad man. And then...all of a sudden he was fine, back himself again. And he always apologized with the same statement. "It was Robert, Ann. Robert did it!" Ann had finally began to question her husbands sanity. A plumber working on the house, who was allowed to take a rest in the upstairs guest room, ran screaming from the house. He said he heard "the doll giggling and saw him scowling at him." In the early 1970's, Eugene became ill. Instead of spending time with his wife and excepting her comfort, he locked himself all alone in the guest room. With Robert by his side. In 1972, Eugene died. In the guest room. Obviously, with Robert beside him. Ann, relieved but heartbroken, quickly sold the house, and left. But not before leaving Robert behind stored buried under what seemed like a million boxes. Several years later, another family bought the home. Shortly after moving in, the new family discovered Robert. Nearly squashed beneath the boxes. Which probably resulted in one of his broken off ears. The couple of this new family took one look at Robert and knew that they didn't want something like this in there new lifestyle and home. The 10 year old daughter of the family, surprisingly, liked the doll and added it to the collection of her china dolls and stuffed animals! It didn't take long for the family to realize that was obviously something very wrong with the doll. Like, Eugene, the little girl would wake up in the middle of night screaming a crying. She said she saw Robert running and jumping up and down around her room. Then climbing on her bed and attacking her. To his day, after more than 30 years, this woman now in her 40's still claims "that the doll WAS alive and wanted to kill her." Shortly after this occurrence, the family got rid of it for good and brought it to the Key West Florida Martello Museum. Now, Robert is displayed in a glass case for all visitors to see his scary face. 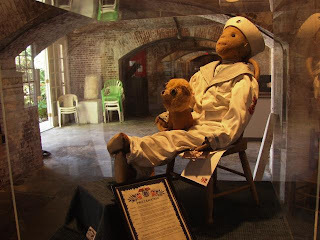 Robert is still at the museum, in his little sailor suit, holding a little stuffed lion that he, appears to be attached too. Employees always remember to introduce new recruits of the museum to Robert. Some visitors laugh at the stupidity of being afraid of a stupid doll, but many change there mind....when they see Robert's angry look starring back at them. Others try to take pictures of Robert in his case, and there cameras will not turn on. They replace the batteries thinking that was the solution, but the new batteries are not working either! When they leave the museum, there cameras turn on and the batteries fully charged. One male visitor, who didn't believe the curse was true, videotaped his entire day at the museum. When they got to the area were Robert was, the sound on the camera turned off and couldn`t be turned back on! He turned around to talk to a employee close by, and the sound on the camera was turned up all the way. Blaring in his ears. Ann's ghost has been sighted in Eugene Otto's old house. Guarding the house in case of the return of Roberts evil spirit. A man who dose the tours of the house claims he has seen her. He says she frequently desends the staircase to the attic. Were Roberts evil form was stored for so long. Other employees say that when they lock up for the night, they leave peppermint candy's in his case as if to bribe him to be good and not disturb anything during the night. They swear when the return in the morning the wrappers are left behind at Roberts feet. The guest room where Eugene died is haunted too. A large bluish-green orb is seen floating throughout the room. The tour guide believes its Ann. A pyhcic who visited the museum tells the employee's and manager that the energy of the spirit inhabiting Robert is slowly dying. Maybe she's right. Because Robert appearance is indeed becoming worn and old. As I said before, one of his ears is broken off, his face has chips and tiny holes from being moth bitten, the paint that was added to his lips and eyebrows has faded drastically, his hair is actually turning white! I had a rabbit when I was young. His name was "Arfke". His name had no meaning. But I lost my rabbit more then a hundred times. And I found the Rabbit more then a hundred times. People even called us to say they found my rabbit. So what ever happened to my rabbit he always returned. Is my doll haunted? Is there a special connection? I left him in my parents house, and he still didn`t showed up in my house. Was it luck I always found my rabbit back? Could be. But I am sure YOU had a strange experience with your doll, something you couldn`t understand. Something you couldn`t explain when you were a kid. But we were kids back then... with a loth of fantasy! The story is so nice detailed and is amazing scary. Robert has his place in a museum and even an own website! That`s not all! You can Email, Facebook and Twitter him! Isn`t that AMAZING! This is what BUST the legend. They commercialize the hole thing! "Robert want you to come back soon!" It is like 'the monster of Loch Ness'. They have a legend and they make money out of it. And they milk it out till the last drip. I don`t think if it was real, the doll would be nicely sitting in his glass cage. 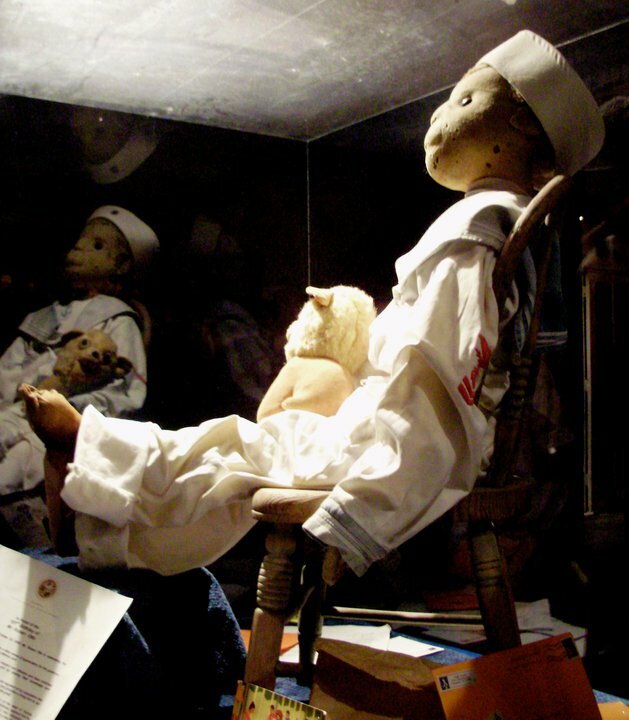 Many people investigated the doll. But no one turned up with hard evidence. So the doll is freaky as hell, and the legend is very nice. But if this thing was real, they would burn and destroy it. Still it is possible to see Robert for yourself! Or you can sleep in the house of Eugene, the Artist House! Did you ever played the Bloody Mary game? You go in front of the mirror, turn out all the lights and say three times... Bloody Mary. When you do it correct, she will appear in the mirror and reveals the future. It is a very popular game played by American teenage groups for fun or a truth or dare. Trying to reveal the truth will be hard, because there are so many versions of the story! 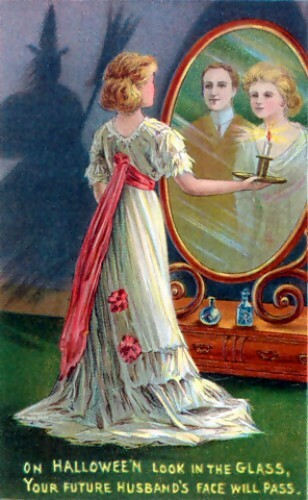 A Historical ritual encourage a young woman to walk up the stairs backwards while holding a candle and a hand mirror, in a complete dark house. When they look in the mirror, they were supposed to be able to see the face of there future husband. But there was a chance that they would see a skull, or the face of the Grim Reaper, instead. That would indicate them that they were destined to die before they got married. In the recent "summoning" ritual, you must not look directly for Bloody Mary, but you must look at your own image in the mirror. The room must be completely dark, but you can have a candle. Say three times Bloody Mary. Then say: "I`ve got your baby!" This modern ritual of taunting Bloody Mary regarding her baby indicates to Queen Mary I, also know as Bloody Mary, whose life was marked by a number of miscarriages or false pregnancies. When she is summoned properly she will appears as a corpse, a witch or a ghost. She will scream at you, cursing you, strangle you. She also can steal your body or soul or drink your blood. In the 1600's, in a small village in England, there lived a healer in a house in the woods named Mary. The villagers called her Bloody Mary because of her unorthodox healing methods. But then a young girl disappeared around Mary`s house. And other children started to disappear. All of the villagers assumed that Mary was responsible. So the villagers decide to act! All of the villagers came up to Bloody Mary`s house. They saw that Mary was getting younger and more beautiful. So they thought she used the children to make her younger with witchery. So they killed her by bleeding her to death and burning her. In her last words, she screamed that all who say her name will be damned. A few days later, strange things started to happen around the village. 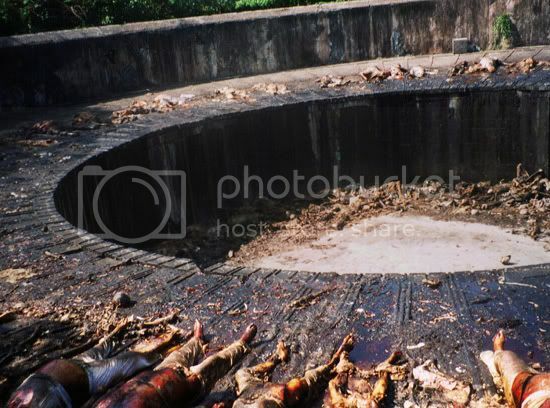 People were found dead with pools of blood around there corpses. The villagers believed they said her name and got killed by the ghost of Bloody Mary. Take a candle, and go alone to a looking glass; eat an apple before it, and some traditions say, you should comb your hair all the time; the face of your conjugal companion, to be, will be seen in the glass, as if peeping over your shoulder. You, my queen, are fairest of all. As everyone who grew up reading "Snow White" (or watching the animated Disney version) knows, the mirror-obsessed queen was ultimately destroyed by her own vanity, and it is in this and similar cautionary tales that we see basic elements of the Bloody Mary ritual emerge. There are so many versions, so many variations! But the important thing is, can you summon something or someone with a mirror? Can you see another world in a mirror? It looks more like a fairly tale... It is been used in hundreds of fantasy stories. And is so over used. Even today with horror movies like "Mirrors". Or the Bloody Mary scene in"Paranormal activity 3". The ritual is so easy to preform... and it takes nothing to do. Okey, it is scary when you are in complete dark, trying to summon a dead woman. And with the candle light blurring your vision. Your mind must go crazy. But the change to see the evil Bloody Mary, or your future husband is little. Let's keep it to a fun game too scare your friends in a truth or dare game.